Ed Horne worked as a volunteer at Child Autism UK (when it was know as Peach). He is now in marketing with a major UK charity. “Joining Child Autism UK as a volunteer was one of the best decisions I’ve ever made – I learnt a massive amount about autism, developed countless new skills, found an industry I’m passionate about and met some wonderful people along the way. “I started volunteering at Child Autism UK just after I’d finished a course in journalism. I noticed Child Autism UK were looking for volunteers and thought it would be a nice area to work in as I’ve always been keen on the idea of working at a charity. “I went to Child Autism UK knowing very little about autism but after a few days the passion and energy the team have to the work that Child Autism UK does rubbed-off on me and as I learnt more about autism, read and heard parents’ stories I quickly felt myself wanting to help as much as possible – I’ve worked at Child Autism UK on a number of occasions and in a variety of roles, I even ran the Great South Run in 2008 to raise money for them! “When I first joined my main tasks were filing, accounts, answering the phone, invoicing, and the like. Knowing I was interested in pursuing a career in journalism, The CEO, Mandy Williams asked me to help revamp the members’ magazine – Speach. Throughout my time at Child Autism UK, I was always given tasks related in some way to my career-aims and interests so was constantly adding to my CV and building new skills. For example – writing and proofreading material for the newsletter, Speach, sharpened my editing skills and conducting interviews with Trustees and parents made me a far more confident communicator. “Other projects I worked on have included researching autism issues/news and government policy, writing on Child Autism UK’s social media sites like Facebook and Twitter, interviewing and writing up Trustees profiles and producing press releases and adverts that have appeared in local newspapers and even in the occasional national, such as the Independent. Sometimes I would do manual work such as carrying heavy boxes, so wasn’t always sat in front of a computer screen! “The team at Child Autism UK are absolutely fantastic – from case-workers to the Trustees – everyone is friendly, supportive and fun and I love the energy and desire they all have in making a difference to the lives of the parents and families they help. “Volunteering inspired me to want to work in the charity sector and the encouragement and help given to me by the rest of the team was hugely influential in my decision to try getting into charity PR. 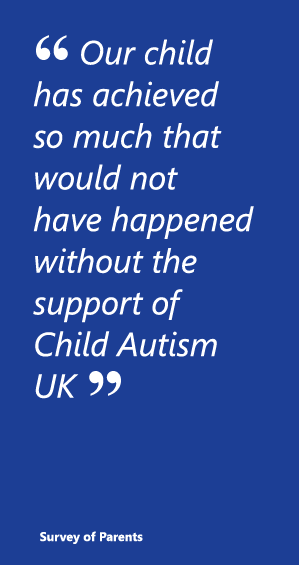 “Child Autism UK kindly paid both my travel and lunch expenses. But on top of this, if you volunteer in a particular area – like I did in PR when I became a ‘Volunteer Communications Officer’, Child Autism UK are happy to pay for you to be trained in this function. I did a desktop publishing course and attended two major PR and communications conferences – The Third Sector’s ‘Creative & Cost-efficient Communications Strategies’ and the Media Trusts ‘Harness the Power of Your Stories’. I learnt a huge amount from these two courses and gave the notes I made to Child Autism UK so they could use this information as part of their own communications strategy. The knowledge I gained from these two courses was crucial to me finding my current job working in the press office of a large gardening charity (yes there is such a thing as a gardening charity). “On top of this I was given tons of help with interview preparation. Mandy organised a mock-interview where I was grilled by one of the case-managers and one of the Trustees – they then assessed the way I responded to questions put to me and I was able to watch myself on video. “Mandy also gave me job advice, structured my workload so I was mainly doing PR work, emailed me jobs and was always there if I had questions about the role or industry. Child Autism UK were also flexible and understood if I needed to go to interviews or needed time to apply for jobs. “The role Child Autism UK played in helping me get a job was invaluable and I’m hugely grateful – it isn’t just the lives of parents and children with autism that Child Autism UK strives to transform – they recognize the potential in all their staff and volunteers and will always go the extra mile to get the very best out of everyone. “If you want meaningful work experience at a charity or are just a passionate individual looking to help a worthy cause, I fully recommend you pick up the phone to Child Autism UK – you won’t regret it.